The PFL-1000, PFL-4000, and PFL-5000 power fault locator systems, available from Macey's Electrical , are compact and powerful fault location systems for underground residential distribution (URD) systems. 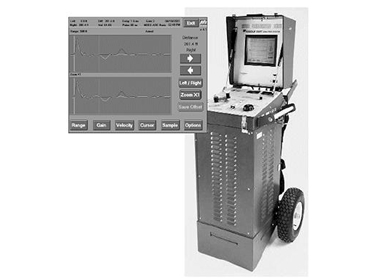 All three power fault locator systems integrate the tools of cable fault locating into one package: dc/tester burner, surge generator and radar coupling. The PFL-1000 fault locator system is designed for installation into the tool bin of a utility service truck. High discharge energy ensures maximum performance on short, medium or long URD loop circuits. The PFL-4000 is designed for portability, featuring all the basic fault locating tools in one rugged base package. It is a flexible stand-alone unit with the capability of mounting the DART in a hinged lid. The PFL-5000 provides all basic fault locating tools in a convenient vehicle-mount package. It is a suitable solution for outfitting URD trouble vehicles with a strong fault locating system. The PFL-1000, PFL-4000, and PFL-5000 power fault locator systems deliver a maximum energy surge of 1536 Joules at 16kV, providing necessary energy to condition and break down faults in cable, joints and terminations. The power fault systems also provide a 20kV proof tester and a 60mA burner for testing and conditioning cable faults. The power fault locators are suitable tools for isolating a faulted cable section between transformers with one surge and measuring distance to the fault. Series includes the PFL-1000, PFL-4000 and PFL-5000.